KIEV, Ukraine -- "Welcome to Ukraine! I am a state traffic inspector," the police officers repeated as they learned English in preparation for the influx of visitors expected for the Euro 2012 football tournament. 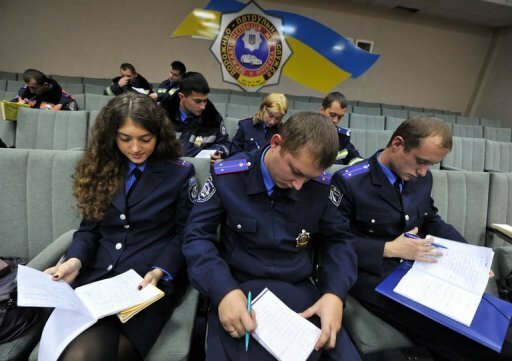 Ukrainian police officers take part in an English language lesson in Kiev's Road Police department in Kiev. Kiev policemen have started a three month English course in preparation for the Euro 2012 football championship. Sitting in their dark blue uniforms like schoolchildren, about 20 Ukrainian police officers repeated phrases to their teacher, keeping careful notes in their work-books. "Do you need any help? May I see your driver's license?," said the students gathered in an amphitheatre at the headquarters of Kiev's traffic police, the polite phrases at odds with their reputation. Ukraine's police are far from well-regarded. Underpaid and under-equipped, the ex-Soviet country's police forces have often been decried as incompetent at best, violent and corrupt at worst. But ahead of Euro 2012, the European football championships that Ukraine is jointly hosting with Poland, the government is making efforts to teach the force good manners, starting with their linguistic abilities. "It is a national shame that police in the centre of the capital don't speak English," Deputy Prime Minister Borys Kolesnikov, who is in charge of preparations for Euro 2012, said in September. President Viktor Yanukovych is well-known for his passion for football and after his election in February made Euro 2012 one of the priorities of his new government. Kiev is now keen to use the tournament as a showcase for the country, after UEFA in April 2007 wrongfooted pundits by picking Poland and Ukraine as hosts over favourites Italy. Plagued by political infighting and economic turmoil, the country has struggled to build the necessary infrastructure but UEFA insisted earlier this year that both countries were on track to be ready in time for the tournament, which begins in June 2012. Free English lessons are being organised for officers in the four Ukrainian cities expected to host matches: Kiev, Lviv, Donetsk and Kharkiv, according to the interior ministry. Initial plans had also called for lessons in French, Spanish and German as well, but officials eventually decided to focus only on English, a daunting enough task on its own. In Kiev, which is expected to host the Euro 2012 final and has about 16,000 police officers, more than 500 are already taking lessons. "This is only the beginning. We hope that by 2012, about 5,000 police officers in Kiev will have taken the courses," Kiev police spokesman Volodymyr Polishchuk told AFP. At the traffic police headquarters in the capital, a group of 21 students gather every Thursday, most of them young but a handful in their 40s. "If the foreigner does not have a passport, ask for another document," said their teacher, university professor Kateryna Litvak. She wrote words like "government issued photo ID" and "driving license" on the blackboard. The lesson moved on to typical questions tourists might ask, including: "I'm lost. Can you help me find the hotel?" and "Where is the bad part of the city?" "In school, we studied generalities, here we are learning concrete things that are needed for the job," said policeman Dmytro Krasnik, 23. The classes even take a stab at encouraging polite chats between police and tourists. "Does he in football?" asked a struggling police major to his colleague. "Do you play football," the teacher corrected. "Yes, I do, I superplay football!" answered his colleague, lieutenant-colonel Boris Bogoslavets, sparking a laugh from the teacher and another correction. "I play football very well," he repeated slowly. Bogoslavets said he had already put his new skills to use after a foreign tourist asked him for directions. "It was a pleasure for me to say 'you go to Malyshka street please'," Bogoslavets beamed. "These courses are great! The people who take them will not dishonour our country." I have a CELTA qualification and have taught English to several different nationalities within the UK. Is there an opportunity to teach English to the Kiev Police Force? Most respectfully it is stated that my brother name Malik Sajid Ali has gone to Ukraine on 3 months' vissa as on legal doc***ents , on 13 August. His pakistani passport number is LE1752351. His invitation number is AA0040068. Shahid's house at 7 km from market stop Odessa. His wife name is Aniya. There telephone number is 00380938212138. He spent nine days there. then his contact came to end at 18 September . He contacted his last call from shahid's house. My brother has done master in physical education and also he is very good player of cricket. His physical fitness is good. kidnapped him and placed him anywhere for money.we came to know later that these invitors make a bussiness of taking pakistani peoples in ukraine after getting a large amount of money. then they kidnaped them for grtting more money. haji tariq is also their workman who has great power there.his telephone numbers are 00380935367620 and 00380939376102. haji tarq said me that he would contact you with your brother after getting some money first then he said me that he cans end the dead body of your brother after killing him but i refused his deal. If there is any consumption of money about doing this task, I definatelly will pay it to you. My contact number is 00923014404572 and e-mail address is khokhar.rajput@yahoo.com . Pease do not hesitate to contact me.I shall wait. We shall be consider you the most benefactor after prophet and God for helping us in this troublfull incident. We say to all UKRAINIAN . Is there anyone who help us in his country because we are not closer to you. For God's sack please find out my brother from these two invitors. He is my only one lovely brother. Hs vissa would end on 21 November 2010 but he already lost from the ending date. May God bless you forever. Thanks for waisting your time of reading my painfull story.